A sweet and romantic dress with ruffles and lace is amped up with the contrasting leather straps and belt around the waist. The Nashville Nostalgia Belted Ruffle Dress is made of a gauzy fabric. It has a tiered ruffle design at the bust and a horizontal row of pearls. The elasticized waist gives way to the flouncy tiered skirt with layers of lace peeking through. The braided leatherette shoulder straps coordinate perfectly with the included leatherette belt. This dress would look perfect paired with pumps, wedges, heels, or flats. 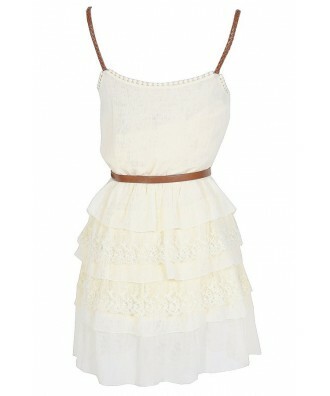 Another option is to pair this dress with cowboy boots for a fun night out. 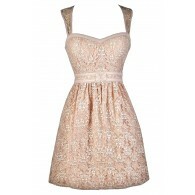 Try tossing a fitted cardigan over this dress on cool nights when you need more coverage. Details: Fully lined skirt. Animal friendly leatherette. 100% polyester. Dry clean only. Small measurements: Length from top of shoulder to hemline: 34". Bust: 34". 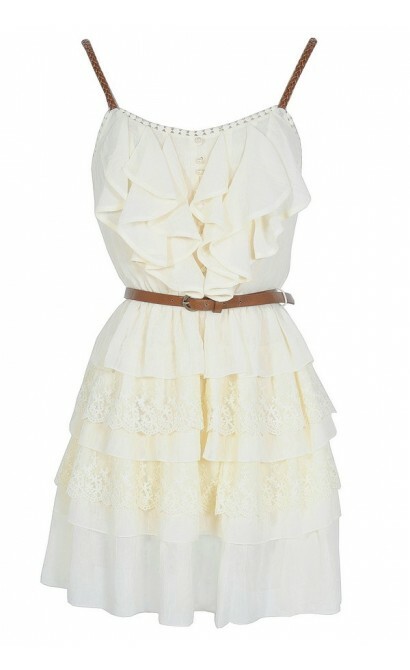 You have added Nashville Nostalgia Belted Ruffle Dress in Ivory into Wishlist. 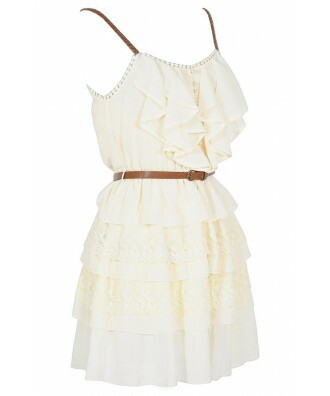 You have added Nashville Nostalgia Belted Ruffle Dress in Ivory for Stock Notification. 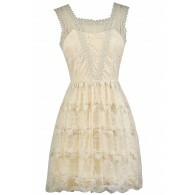 You have set Nashville Nostalgia Belted Ruffle Dress in Ivory as a loved product. 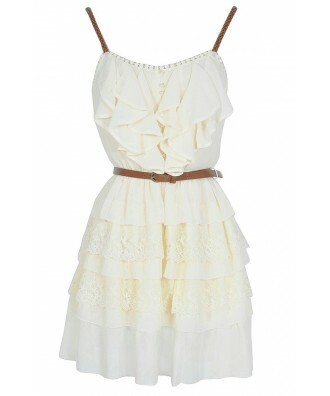 You have removed Nashville Nostalgia Belted Ruffle Dress in Ivory as a loved product.